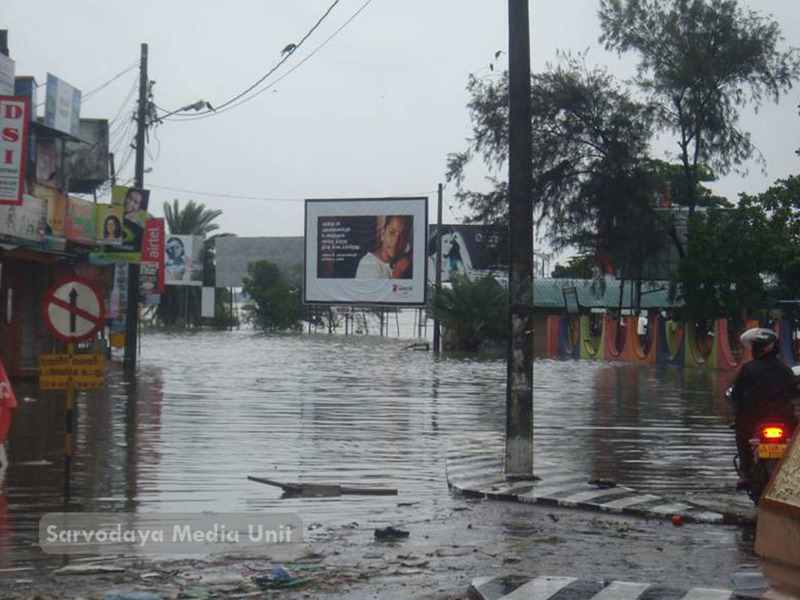 Due to the heavy rainfall that began on Saturday, January 8, 2011, and has continued unabated until today (Tuesday, January 11), more than half the villages in the Batticaloa district have been submerged, with the population forced to seek refuge in schools and temples in the dry areas nearby. 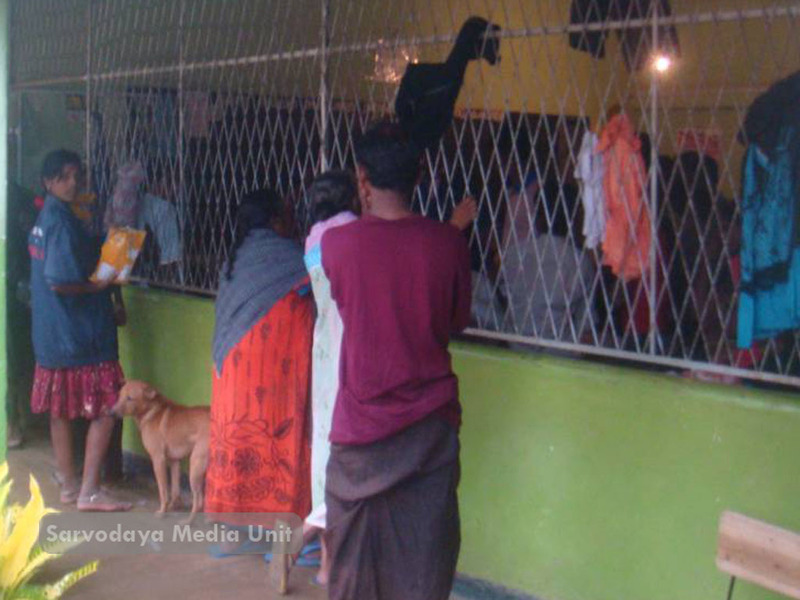 On January 9, Sarvodaya began distributing flood relief items to the people who were forced to flee their homes, and continues to provide relief support to victims in isolated areas. 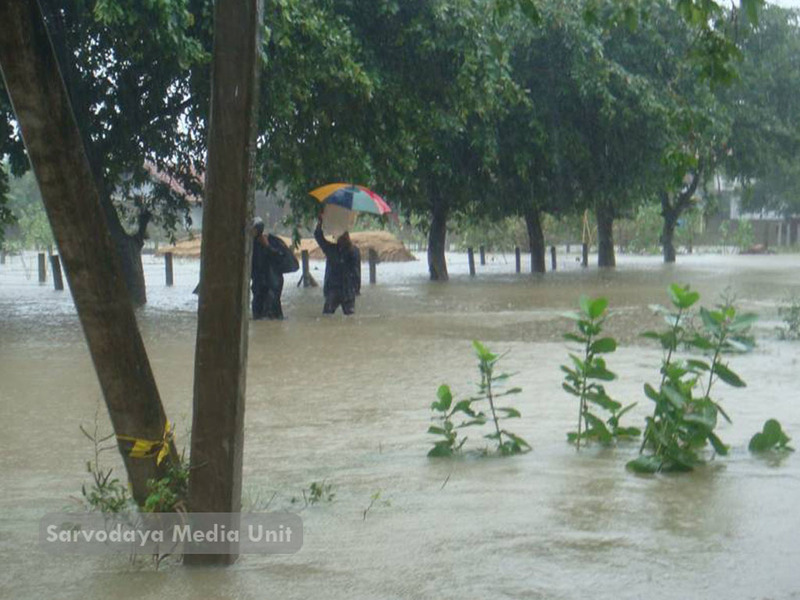 Almost all the villages in the Vavunativu DS Division are currently underwater. 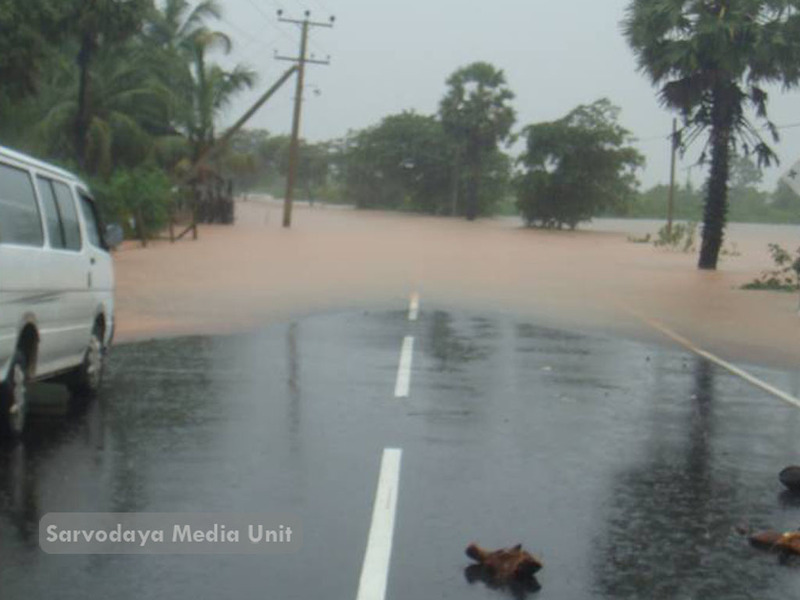 Roads are impassable and the Vavunativu Bridge has been damaged, cutting off the nearby villages from the town of Batticaloa. 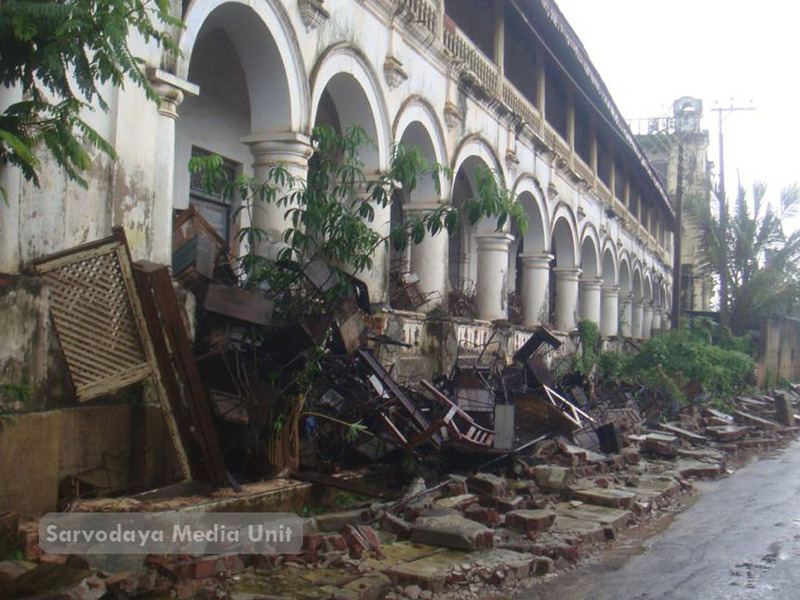 Hospitals, government offices and shops are unable to function. Most homes have been cut off from their power supplies. 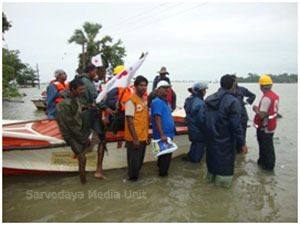 Sarvodaya is in the forefront among the organizations working to help the victims in these villages. 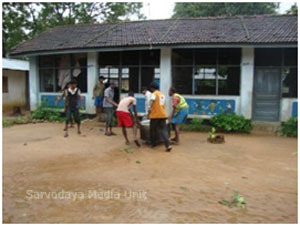 A long-time partner with the villagers, Sarvodaya has been active in the area for more than 12 years. 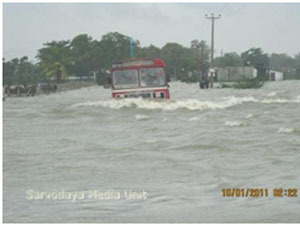 Currently, the villages are accessible only by boat, and Sarvodaya’s relief items are being delivered by boat. 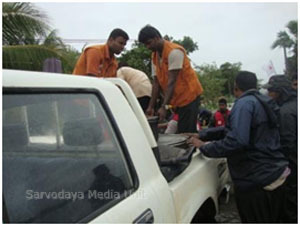 On January 9, Sarvodaya staff distributed 164,008 Rupees worth of food parcels, mosquito coils, candles, Panadol and matches to more than 1,800 flood victims. Aid packages were distributed in the following locations: Weermuna Maha Vidyalaya; Suduwella Village, Indrasara Maha Vidyalaya; Maha Oya; Achchalachchena; Kalmunai-Division; Dehiattakandiya Technical College; and Kalmunai Pandrippu Camp. 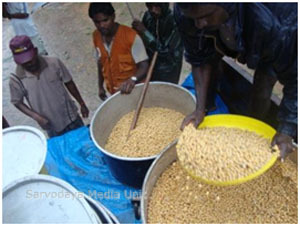 In addition, 200 kg (31,000 Rupees) worth of chick pea were distributed in Mahala Wattawn and Narippul. 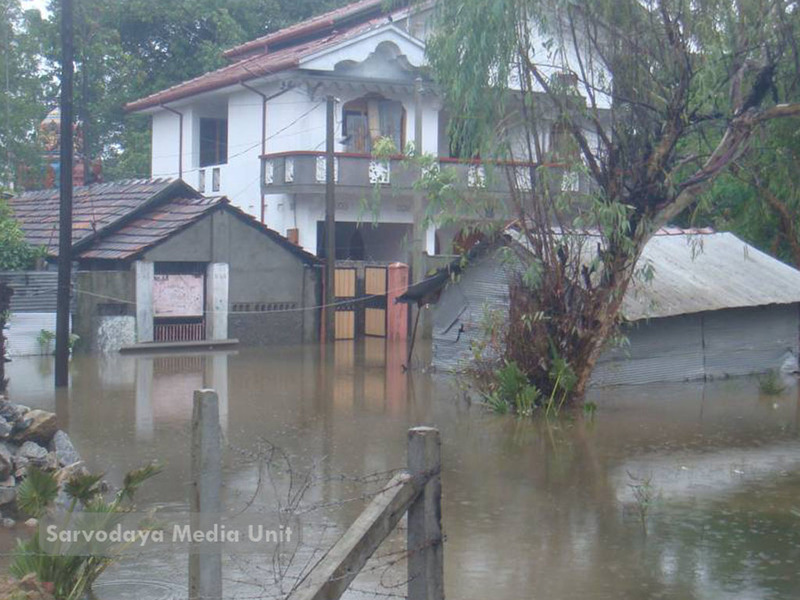 The floods have damaged 80 houses in Kalkudah, 140 houses in Mahilavedduwan and 12 houses in Naripulthoddam. Due to the damage caused to the Vavunathivu Bridge, all relief items were transported to these villages via the A5 route to Aithiamalai. In addition, 200 kg of chick pea (31,000 rupees), as well as 171,000 rupees worth of food parcels were distributed to 1,900 flood victims in the following locations: Indrasara Maha Vidyalaya; Mahaoya; Uhana (Walagampura/Adaloya/Nawagiriyaya) / Samnthure (Weeramuna Maha Vidyalaya/Samanthure Maha Vidyalaya; and Dehiattakandiya, Mavanawela Technical College. In addition, 200 kg of chick pea (31,000 rupees), as well as 63,900 rupees worth of food parcels were distributed in the following locations: Uhana (Nawagiriyaya); Samnthure; Eravur D.S. Division; Kidiranagea; Thaleinagar Vidyalaya; Ameer Ali School; Arafath School and Lyankeary.